Boundaries are important for everyone, but especially critical if you’re dealing with a narcissist. If you’re having a narcissist over for holiday dinner, be prepared for them to arrive late, complain about the food, victimize themselves, and to make everyone’s happy time, well, less happy. If dinner is to be served at 5pm sharp, then keep to your schedule and maintain your boundaries. If they are late to dinner after you’ve already advised them of when dinner will be served, then serving dinner later to accommodate a narcissist is not an option – especially when other guests arrived on time. Keeping to your schedule will help keep you on track, and will establish necessary boundaries that you won’t (and shouldn’t!) accommodate their whims or dramatic stories about why they’re late (again) for another holiday dinner. Narcissists will be narcissists. This includes them complaining that the mashed potatoes are lumpy, the dinner rolls are stale, the champagne is flat, or your decorations are ugly. Be prepared for their insults, their half-assed, backhanded compliments and their stories that make them out to be a victim. Again. You may even hear the same story from them for the umpteenth time where they’re villainizing someone while playing a martyr. 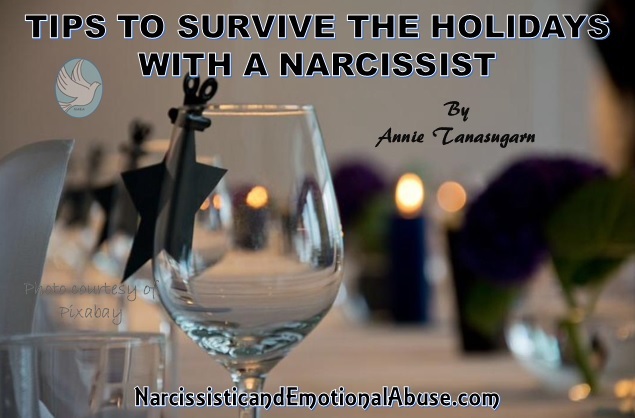 If you prepare yourself ahead of time for this inevitable part of having a narcissist over for the holidays, it will make your holiday less stressful. Ignore their insults and backhanded compliments, don’t feed into their martyrdom and give yourself space (boundaries!) because they are who they are, and they aren’t going to change – whether it’s the holidays, or not. This little word has the biggest impact for your sanity, your peace of mind, and for the joy the holidays (should) bring. By disengaging from a narcissist’s drama, you are re-engaging with your own self-worth and self-identity. You are not their insults. You are not their backhanded compliments. You are not the villain in their victim stories. By mentally and emotionally disengaging, you are taking your power back – and making your holidays a little brighter. To disengage, you can mentally tune them out when they start in with their shenanigans, or you can walk out of the room and run to grab something from another room (towel, silverware, favourite serving platter, etc). This can buy you a few precious moments to take a few breaths, and re-centre your energy. Narcissists are notorious for going into a narcissistic rage over minor things: they spilled soup on the tablecloth; they arrived late and blamed it on a slow driver; they chipped their nail polish getting out of the chair. The list goes on in how seemingly unimportant issues can trigger a narcissist’s temper, and proceed to dump on the holiday joy. If you can’t cut the visit short by using an excuse that you have another engagement, then try redirecting the conversation by asking them to find a DVD for the kids, or to turn the holiday music on. Giving them a simple task may not stop their bad mood, but it can buy you some time to redirect your own energy and disengage from their drama. Self-care is an important part of healing, remaining healed, and in strengthening your personal boundaries. After the tension from the holiday party is over, set some time aside for a hot bath, a glass of wine and a good book, a brisk walk in your neighbourhood, or some other activity that can help you decompress and get back on track. Journaling is also an excellent activity to jot down your feelings and thoughts, especially after an emotionally charged day! 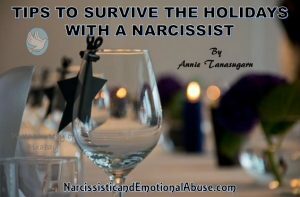 Planning ahead for the (inevitable) drama that a narcissist will bring to the holiday party can help you navigate the storm unscathed and make your holidays more joyous and less stressful.